I’ll be playing piano and singing for most of November. If you’re in the neighboring apartment, I apologize. Otherwise, I promise you’re going to love this new look. There are 10 chances to catch Thomas Paine in Violence presented by HERE Arts Center in association with thingNY. Tickets start at $25. Get them HERE! HERE Arts Center in association with thingNY. Thomas Paine in Violence is an electronic psychedelic opera-sermon set in a radio station in the afterlife of the Founding Father and international activist. 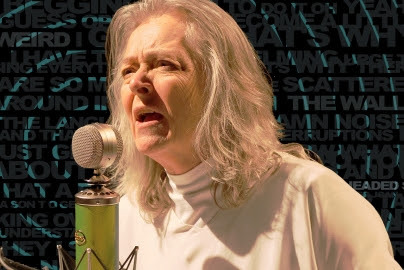 Joan La Barbara portrays Paine struggling to broadcast a message of economic justice amidst a whirlwind of lightning-quick singing, autotuned shock-jockery, gadgets, voices, instruments, and sonic chaos. Huge thanks to Ne(x)tworks, thingNY, The Industry, and Experiments in Opera for developmental support. New works exploring the wide-ranging ways of synthesizing saxophone and voice by Felipe Lara, Christopher Dietz, Erin Rogers, Zach Sheets, Chris Fisher-Lochhead, and Dave Reminick. From haunting whispers to nonsensical shouts, each composer uniquely integrates the human voice.